Much like the brutal, ruthless gangsters that populate many of his films, Johnnie To has staked out his own turf in Hong Kong action cinema, depicting dark, stylish examinations of the triads and their internecine struggles for power. Earlier works like “The Mission” and “PTU” at once epitomized and transcended genre tropes, with the complex machinations and reversals of fortunes of his steely male characters heightened to near abstract expressionism. To continues his rarification of the triad film genre with “Triad Election,” also known as “Election 2.” It is a continuation of the saga of Wo Sing, a triad society that has been in existence for many years. 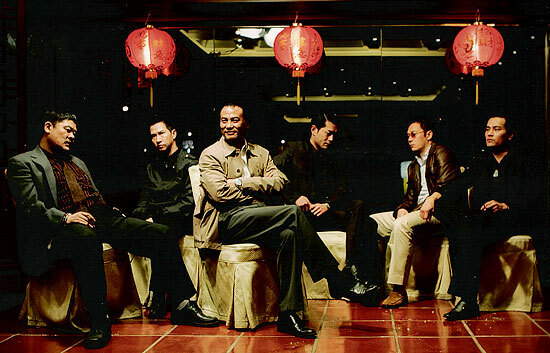 The film focuses on the vicious campaigns waged by the current chairman, Lok (Simon Yam), and his younger rival Jimmy (Louis Koo), his future successor. Jimmy sees this post as a stepping stone to becoming a legitimate businessman. However, he learns to his dismay that he won’t be allowed to leave this life as easily as he wants. Much of the film’s drama – not to mention the source of some scenes of quite graphic violence – focuses on Jimmy’s increasing tenacity and obsessive drive for power, which erodes any sense of morality he may have possessed before pursuing the chairmanship. The characters’ rivalries are initially unclear and confusing, and it does help to have seen the first part of the story. Nevertheless, To skillfully paints a picture of characters warring within traps largely of their own making. He also injects some political commentary, centering on mainland Chinese involvement with these triad gangs. Their role as puppet masters enable them to use these internal wars to enrich themselves and create a “one China” of crime and multinational business. Crime is a never-ending cycle in this film, not only because of Jimmy’s seemingly doomed attempt to escape this lifestyle, but also because it stretches across generations, as Jimmy’s own son replicates in his school the actions of the adults, and also exhibits every sign of continuing the family business. “Triad Election” is a remarkable examination of the ways such seemingly positive ideas as tradition and family loyalty can be twisted into disturbing ends.